Ruby red with a pink collar, this chewy tart lambic features plenty of cherry with a solid dryness. It's sweet but a little sharp with a soft but mild carbonation. 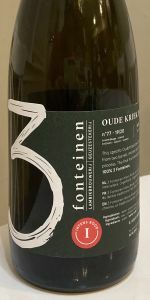 This is mostly clean with little funk or complexity, which is surprising for Drie Fonteinen, but there is a touch of pepperiness. Cheers to friends who opened this b1 bottle for a whole group to enjoy! 750ml bottle that I think was $45 after shipping. New silkscreen label, either batch 34 or 35 16/17 season. Deep, dark red, almost purple, tons of carb and a pretty decent head that lingers. Aroma is great. Heavy cherries, slight lambic funk. Flavor is nice cherry, cinnamon, pretty tasty. Overall I won;t chase this beer but it is a good kriek. Is it better than the regular 3F Oude Kriek? hard to say but it is tasty. dark intense red, no head. smell, sweet cherry, oak, not completely blended. taste powerful burst of sourness, with an initial sweet-vinegary flavour, but not artificial. Then in seconds, it develops to more of an all round yeast earthy. gentle fizz. smooth. the sourness disappears quickly - its bizarre! feel is a little watery side, but goes well with the beer. certainly a sipper, really interesting and enjoyable! out of curiosity would love to try again with one thats aged for considerably longer! 750 ml bottle into tulip glass, bottled on 5/28/2015. Pours slightly hazy deep ruby red color with a 1-2 finger fairly foamy and fluffy pink head with good retention, that reduces to a thin spotty lace cap that lingers. Slight spotty lacing clings on the glass, with a light amount of streaming carbonation. Aromas of big tart/tangy cherries, cherry pits, almond, fruit skin, raspberry, lemon, green apple, red grape, hay, straw, grass, toasted oak, wheat, cracker, and biscuit; with light notes of leathery/musty funk, pepper, red wine vinegar, vanilla, and yeast/oak earthiness. Damn nice aromas with great balance and complexity of cherries, fruity/earthy/funky yeast, oak barrel, and bready malt notes; with great strength. Taste of big tart/tangy cherries, cherry pits, almond, fruit skin, raspberry, lemon, green apple, red grape, hay, straw, grass, toasted oak, wheat, cracker, and biscuit; with light notes of leathery/musty funk, pepper, red wine vinegar, vanilla, and yeast/oak earthiness. Light-moderate fruity/lactic tartness; with light fruit tang and yeast/oak spiciness on the finish. Lingering notes of tart/tangy cherries, cherry pits, almond, fruit skin, raspberry, lemon, green apple, red grape, hay, straw, grass, toasted oak, wheat, cracker, biscuit, light funk/vinegar, pepper, and yeast/oak earthiness on the finish for a while. Fantastic complexity, robustness, and balance of cherries, fruity/earthy/funky yeast, oak barrel, and bready malt flavors; with an awesome malt/tartness balance, and zero puckering flavors after the finish. Light-moderate increasing dryness from tartness, spiciness, and fruit tang. Medium carbonation and body; with a very smooth, moderately bready/grainy, fairly crisp/acidic, and lightly tangy/tannic balanced mouthfeel that is awesome. Zero warming alcohol as expected of 6%. Overall this is a fantastic Kriek lambic! All around outstanding complexity, robustness, and balance of cherries, fruity/earthy/funky yeast, oak barrel, and bready malt flavors; very smooth, crisp, and refreshing to drink with the mellowly acidic/tannic/drying finish. More of a balanced Kriek, but still has a lot of nice wild complexity and oak presence; with huge amounts of cherry fruit character. A highly enjoyable offering. Pours a deep plum color, incredibly vibrant carbonation to the point it mists onto your nose as you smell it, or on your hand. I found the aroma to have too strong of a musty oak smell, and the tannins also verge on excess. There is a dark sour cherry aroma, but you have to strain for it, and the sweetness it provides isn't blended well against the earthy yeast and oak. The taste recovers somewhat, as there is much more expression from those robust dark cherry flavors. It starts with a small sour kiss, and within the body those wood & yeast flavors play more of a supporting role. There is a sweetness but it is never cloying or artifcial. Vinegary tannins poke their head up here and there, but aren't overwhelming and serve as a good contrast to the sweetness. With how vivacious it poured I was surprised to find very little carbonation in the actually body, which was disappointing. Could easily take another 5-10 years. Delicious but still a lot of fruit sugar for the bottle to age on. 06/26/2017, in Bruges, Belgium. 2012 vintage.